MANAGUA, May 3 2013 (IPS) - Nicaragua, which is prone to natural disasters like hurricanes, earthquakes and flooding, is confronting them with prevention measures and community drills and training in high-risk areas. 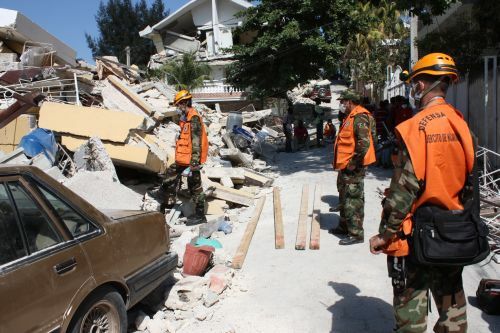 The army’s civil defence unit and different government agencies began to put in place a permanent plan for safety, prevention, preparedness and assistance in the most vulnerable areas in 2010, Colonel Néstor Solís, the head of civil defence, told IPS. The programme has been complemented with legal action and educational campaigns aimed at blunting the impact of natural catastrophes in high-risk areas that are home to 2.1 million of Nicaragua’s six million people, according to the risk map drawn up by the civil defence unit, which forms part of SINAPRED, the national system for disaster prevention, mitigation and attention. Commander Javier Amaya, director of the national school for fire fighters, said courses to “strengthen local capacities to confront and reduce the risk of disasters” are organised with support from the army’s humanitarian rescue battalion and ecological battalion, which were created to operate in the case of natural catastrophes and emergencies. The population of the Pacific coastal region, the most heavily populated and flattest part (with the exception of a string of volcanoes) of this impoverished Central American country, receive instruction on what to do in the case of earthquakes, volcanoes or tsunamis; people along the eastern coast are trained to deal with hurricanes and flooding; and people in central Nicaragua, a landscape of high mountains and large rivers, are instructed in what to do in the case of flooding, landslides and forest fires. This year, the alert has been sounded especially in the autonomous North Atlantic and South Atlantic regions on the Caribbean coast. According to William Gray, Professor of Atmospheric Science at Colorado State University in the U.S., nine of the 18 named Atlantic storms forecast for the next hurricane season – June to November – will be full-fledged hurricanes. The two autonomous regions, which cover nearly the entire eastern coastline of the country, has an over 60 percent likelihood of being hit by four of the hurricanes, said the executive secretary of SINAPRED, Guillermo González. Some 50,000 people – mainly from the Miskito, Sumu, Rama, Garifuna and Creole minority ethnic groups – who live in 16 municipalities in the country’s Atlantic regions, are at particularly high risk because their homes are flimsy shacks along the so-called “route of the cyclones”. The area has suffered wholesale destruction from several hurricanes throughout the history of the country. The most recent were Hurricanes Joan in 1988, Mitch in 1998, Beta in 2005 and Felix in 2007. Solis said the left-wing government of Daniel Ortega has a general plan to address all kinds of natural disasters, not just hurricanes. “We prepare on a daily basis for any scenario, including worst-case scenarios, because we don’t know when we might face a difficult situation,” he said. The capital city Managua, home to 1.5 million people, is especially vulnerable to earthquakes. Poverty and a lack of urban planning has led to the mushrooming of squatter settlements, where seismic building codes are flouted, even though the city is crisscrossed by 18 fault lines and experiences numerous seismic events every month. The local authorities estimate that some 300,000 people live in 120,000 irregularly built dwellings in the city. A study on Managua’s vulnerability, carried out by SINAPRED in 2010 and updated this year, predicts that more than 30,000 people would be killed and 53,000 homes destroyed if the capital were hit by an earthquake registering 6.9 on the Richter scale. “I never thought there were so many dangers to my family in my neighbourhood. I can’t imagine a disaster happening, but at least now I know how to act to protect my people,” Luis Antonio Carrión said during a training session in a poor neighbourhood on the west side of Managua. Because of the low level of rainfall in the last rainy season (May to November), Nicaragua had an unusual number of forest fires in the dry season (December to April). Fires destroyed 15,375 hectares of forests from Jan. 1 to Apr. 18, including 9,084 in protected reserves, where thousands of fire fighters, volunteers and specially trained members of the military were deployed to fight the flames. In the last 20 years, Nicaragua has suffered the impact of 44 extreme climate events. Honduras, Myanmar and Nicaragua were the “most affected” by extreme weather for the period 1992-2011. These events claimed on average 160 lives a year in Nicaragua and 329 in neighbouring Honduras, according to the Index. Nicaragua’s natural disaster preparedness and prevention plan is backed by the country’s leading environmental organisations. Kamilo Lara of the National Recycling Forum, which groups dozens of environmental organisations, told IPS that the plan would have a short-term positive impact in terms of assistance for vulnerable populations, and that as people get organised and become aware of the dangers posed by climate change, the long-term positive impact will be felt too. The government is providing instruction to 2,000 young people who will go door-to-door to teach people how to take the necessary measures in their own homes in preparation for possible disasters. In addition, 250,000 pamphlets will be distributed, containing information on shelters and assistance centres, environmental advice and recommendations for good ecological practices. Scientist and ecologist Jaime Incer Barquero, an environmental adviser to the government, applauded the plans for training, assistance, preparedness and prevention.